Mohammad Tamimi, the cousin of Palestinian resistance symbol Ahed Tamimi went into a coma for three days after being shot point-blank in the face by Israeli soldiers during an overnight raid on Dec. 19 on their Ramallah house. 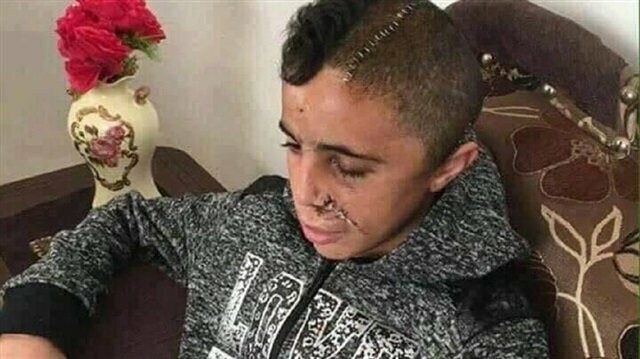 The rubber bullet went through 14-year-old Mohammad’s jaw and exited through the top of his head. Mohammad, who was admitted to the hospital and underwent a six-hour operation, went into a coma for three days. Doctors had to surgically remove a part of his scalp in order to alleviate pressure on his skull. He will undergo yet another operation in the coming days. Mohammad Tamimi was previously arrested and spent three months in an Israeli jail. He went through this terrifying ordeal just five months after being released from prison. Mohammad Tamimi, who lives in the West Bank city of Ramallah, became a Palestinian symbol who exposed Israeli cruelty against unarmed women and children, which led to global condemnation. An Israeli soldier attempted to arrest then 12-year-old Muhammed whose broken arm was in a cast. 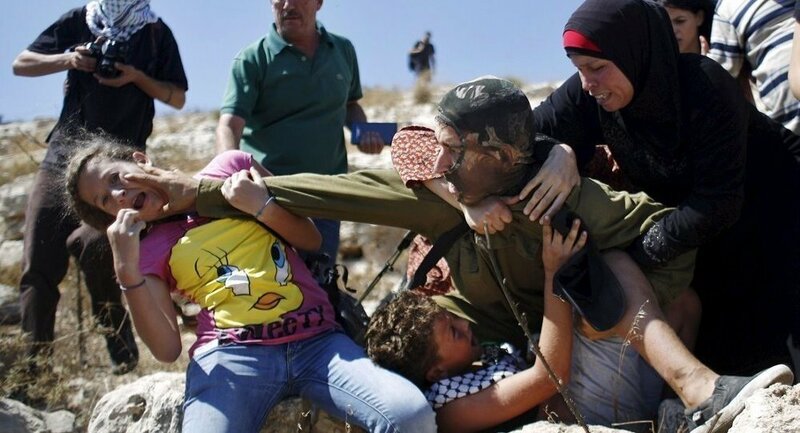 Video footage of Tamimi’s family trying to stop the soldier from arresting him sparked worldwide outrage. In 2012, Tamimi escaped arrest after his aunt, and cousin Ahed, who became known as the “rebelious girl who stood up to the Israeli army,” fought back with all their might against the soldier. Israel continues to mentally and physically abuse Muslims living in Palestine by increasing its terror activities every day. Children are being detained and tortured in the region where violence prevails, and they are only released when a large amount of bail is paid.Sixteen-year-old Fawzi al-Junaidi, who was arrested on Dec. 14 by more than 20 Israeli soldiers during protests held in the West Bank against trump’s decision declaring Jerusalem as the Israeli capital, was released on 10,000 shekels ($2,880) bail, after being detained for three weeks. Al-Junaidi has been a symbol of Palestinian resistance against the occupying state of Israel.In 2017, over 400 children between the ages of 14 and 25 were released by Israel, demanding 10,000-15,000 shekels ($3,000-4,000) per child. Israel has earned over $1.5 million in 2017 by selling the freedom of Palestinian children in this manner.Israeli court extends Palestinian teen's detentionSeven thousand Palestinians still detainedThe most important reason Israel resorts to earning money on the freedom of children is that the Palestinian families live in poverty. The occupying state keeps the amount high as they are sure that the families cannot afford to pay the set bail. Palestinian Muslims collect money thanks to their culture of solidarity, and save the children from the prisons of Israel.While 7,000 Palestinians are still detained in Israeli prisons, 591 people, including 300 children, are being given life sentences. Israeli troops, conducting pre-dawn raids on Wednesday in various regions of the occupied West Bank, detained 14 more Palestinians.There are nearly 3,000 associations in Israel aiming to Judaize Jerusalem. The Ir David Foundation, also known as Elad, has an income of $1.5 billion. Moreover, the Municipality of Jerusalem gives $1 million in financial support to the projects aiming to Judaize Jerusalem, while the annual amount of money transferred by Muslims to Jerusalem is no more than $15 million per year.Palestinian activist Tamimi’s Twitter account deletedThe Twitter account of Ahed al-Tamimi, the brave teenager who was detained by Israeli forces, has been deleted. Claims say the account was closed as the number of its followers, which was 3,500 before, reached 14,000 in a week. Tamimi’s relatives confirmed that the account was closed by Twitter. Palestinians launched a campaign for the reopening of her account.